Long Exposure Photography tutorial, how to shoot, follow me. What gear we need for taking long exposures? I personally believe that the price of your photography gear doesn’t matter at all. All the equipment you need is a camera with the bulb function, in other words, it allows you to hold the shutter open for more than 30 seconds. Next, you need a remote shutter release, lens cap for the viewfinder and a solid tripod. This first and a very important step is often underestimated. The composition is everyting in photography! No matter the gear you have, you can be at the most beautiful place in the world but if you do not master the basics of composition, your photography will most probably not appeal to anyone. When you get to the shooting spot and discover a scene suitable for a long exposure, do not start unpacking the tripod immediately. When looking for the right composition, always look through the viewfinder. Take some sample photos with different compositions, then browse them on the LCD display; this will allow you to see, which photograph works well and which one doesn’t. Once the scene is ready, it’s time to take out the tripod. Using a solid tripod for taking long exposure photographs is the basis of everything. I normally take exposures from 2-4 minutes which means that any move of the camera can mean a destroyed photography. When you start taking long exposures on a regular basis, you will experience different conditions such as strong wind or taking pictures with the tripod standing in water. Do not try to buy only the cheapest or easiest, be a little bit less lazy and you will certainly appreciate the extra weight in the field. I’ve heard many photographers saying that the best tripod is the one that you grumble about because it makes your back hurt. On the market there are many types of remote shutter releases, with a cable, with a timer or without it. I prefer a remote shutter release cable with a timer. Although, it is not a condition. At first, I was using a remote shutter realease cable without timer and I was stopping the time on my mobile. Shooting is much easier and much more comfortable with a timer and you don’t need to control the time constantly and use this time for thinking about a possible next composition of the scene you’re shooting. I do this quite frequently with long exposures, I walk back and forth looking for another inspiration. When shooting long exposures, it is necessary to focus before placing the ND filter. ND filters that are used for daytime long exposures are very dark and you can’t focus through them. Besides, when you look through the viewfinder with the ND filter on, you can’t see absolutely anything, which is why it is important to compose the scene first and only after that place the filter itself. This step is not true for everyone. The point is that once you have prepared a scene and you want to place the ND filter on the lens, you might press a little harder when setting the filter and blur the photograph. The worst is that you do not necessarily spot this at the place and can notice at home. The more expensive lenses have a firmer zoom and the possibility of blurring the photography when placing the filter is rare. How to avoid this? If you want to make sure that you will bring home a useful photograph, there is one possibility. Buy a special tape in photo store and simply stick this tape over the zooming ring. It is an easy and painless solution. Would you like to know whether I also use this technique? No. I have a lens that has a zoom ring which is firm enough and I am also very cautious when placing the ND filter on the top of the lens. As I have already mentioned, it is really up to you, whether you leave this step out or not. If you don’t know how to meter an exposure correctly, don’t lose hope. Nevertheless, there is not enough space to explain all this here, since I have dedicated to it a separete chapter, which you can find in my blog. Switch the camera to the fully manual mode and set up the apperture, ISO and leave the time of the shutter in position BULB. The BULB position means that the shutter will stay open as long as you want. Set the time needed for a correctly exposed photorgaph on the remote control or, if you don’t have a timer, you can use the stopwatch of your mobile phone. I will give you only one piece of advice about filters – keep them clean. In the postprocess you will see every single grain of dust, every drop and smudge. Make your work faster with the adjustment of the photography itself and you won’t need to use the cloning tool in photoshop so much. The topic: „filters in long exposure photography“ will be discussed into more detail in separate articles. 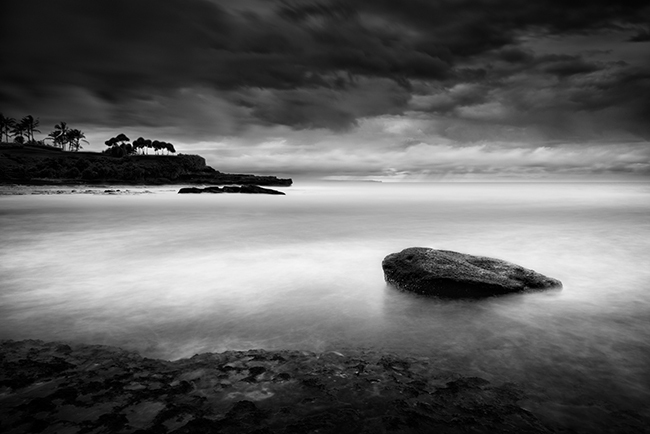 Please check my article about using B+W filters or LEE filters for Long Exposure Photograpy. Step 8: Cover the viewfinder! Attention, this step is extremely important for long exposure shooting with the ND filters! This is mentioned only in few tutorials, yet, it is one of the most important steps, which you should pay attention to in long exposure schooting. What is it? When you keep the shutter open for some time, light can get inside through the viewfinder and you might seen some undesired artefacts on the photoraphs that cannot be removed later in the postprocess. Many long exposure photographers just don’t know what they have done wrong, when this happens to them. Sometimes they have a nice useful photo and sometimes not and they keep wondering how is this possible? It‘s because this phenomenon can occur but not necessarily. It depends on the light conditions at the time of shooting, whether the sun behind your back or not or some others. I insist that the viewfinder should be ALWAYS covered! Why just to hope that the pohotography will not be lit by the sun? How to cover it? Digital cameras come with covers for viewfinders in the original packaging, although some later models like Nikon D800 for example, have a flap installed on the top of the viewfinder. Sometimes people stick a sellotape over the viewfinder or simply use a piece of fabric or anything to avoid the sun to get in. So, if you have followed my previous steps and you have the perfect composition, the camera with a remote shutter release cable is ready on a solid tripod, you have measured the exposure, covered the viewfinder with one or various filters on the top of the lens, this means that you really ARE READY TO PRESS THE BUTTON. There is no step 10, I just wrote it here to get an even number. Thugh, there is one thing which you need to keep repeating to yourself when shooting long exposures – experiment! Try different settings, times of different lenghts, compositions and eventually, you will find out what you like best and what makes you feel satisfied. In case of any questions about Long Exposure Photography or anything else, please, do not hesitate to contact me. I’ve browsed through your website and I love what you’re doing here with all the great photos and tutorials! Very well written, very concise and clear. Great work overall and happy to have met you in person last year! I appreciate your kind words very much! I am also glad that we met last year in Berlin because it was your excellent work which convinced me to think about that fine art photography is what I am going to focus on! My name is Fernando, from Argentina. I’ve been two years or a little less in the long exposure photography, I want to share two tips for someone who is starting. When using circular filters, it is advisable to place the camera pointing to the sky before removing the filter, to avoid hitting the filter against the ground.